HUDSON, FL -- Wayne Brown and Roger Pacheco bought security cameras and put security signs on their front lawns 10 years ago to fight crime. 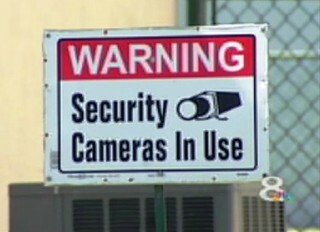 They say the cameras and signs did the trick and have even helped law enforcement catch crooks in crimes at neighboring properties. All those years, no one in the neighborhood complained. But now, the Beacon Woods East Homeowner's Association in Hudson says the signs are against their deed restrictions and have to go. The HOA sued both Brown and Pacheco. They say they feel targeted for no reason. "I've defended my country, and I'll defend my property," said Brown, who has hired an attorney and plans to fight the lawsuit. Something that makes this case even more peculiar is that Brown and Pacheco have two of the best looking lawns in the neighborhood. Other homes have unkept lawns and mold growing on the side of their homes. But Brown and Pacheco have lush, green grass and clean homes. And they're certainly not the only ones with security signs. The deed restrictions say no signs, but state law trumps that restriction. 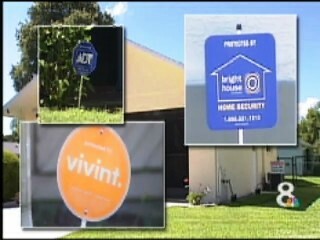 The law says all Florida homeowners can have one sign, provided by a commercial company. HOA attorney Matthew Ellrod says Brown and Pacheco's sign is not protected by the law. Their signs were purchased at Home Depot and they have multiple signs, instead of just one, as the law provides. "The HOA is just now objecting to this because they just noticed the signs," Ellrod said. Brown has two signs and Pacheco has three signs He has one at each of the doors to his house, which is located on a corner lot. Brown's attorney, Kenneth Foote, says this case is not about the letter of the law, but the spirit of the law. He says this HOA uses selective enforcement of rules. Foote says the legislature didn't intend to keep homeowners from protecting their own homes, for free. And he has a big problem with the fact that this HOA waited so many years before complaining. "When you have people who use their authority to harass homeowners over personal disputes, that is a problem," Foote said. "I'm sure other homeowners would rather use their dues in some other way, instead of fighting my client over a security sign."